Having merged with Moonpig last year Photobox offers a good range of quirky photo printing ideas, although the site is more focused on the creation of personalised photo books and wall decor. Within the canvas range you’ll find three quality levels: Lite (18mm thick), Classic (38mm) and Premium (47mm). You can also choose from acrylic, aluminium, and enlarged poster print options – framed and unframed, mounted and unmounted. Basically, if you’re looking to turn an image into something to hang on a wall then Photobox will leave you spoilt for choice. You’ll need to set up an account before you can upload images, although as an incentive Photobox will give you 40 free 6x4in prints. 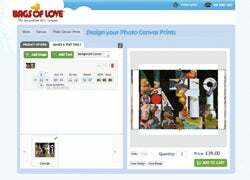 Once you’ve signed up, creating your prints or gifts is fairly straightforward and can all be done on the site; the editing page even updates and displays your photo printing items as you make them so you can get a good idea of what they’ll look like. 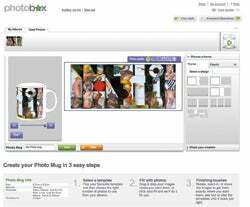 It also lets you know whether your uploaded image is big enough to print at your desired size. From mouse mats to fridge magnets via calendars and cushion covers, Jessops offers an impressive range of personalised photo products. For traditional wall decor, Jessops only offers one canvas depth (17mm), but there are myriad sizing options – everything from small 20x30cm prints to wall-covering 90x160cm behemoths. 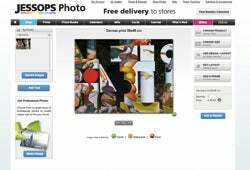 Jessops also offers a split canvas option, should you want to divide your image into quarters with each segment printed on a separate canvas. Alternatively, you can have your images printed on aluminium or behind an acrylic block (5cm or 10cm thick), which will add depth to your image and make the colours pop. 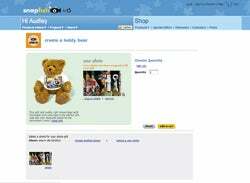 There’s no need to register an account and you can create all your gifts directly on the website. The product creation page is neatly laid out with the tools you need clearly labelled. The creation page updates in real time, to give you an idea of how your finished item will look, while the editing page also tells you whether your image is big enough to print at the size you’ve chosen. Snapfish offers an extensive list of photo printing ideas – from T-shirts to calendars via key ring fobs and snow globes – that can be personalised with your photos. Canvas prints are available in five sizes ranging from 10x8in to 24x20in and acrylic block prints are also available, although there’s no option to make aluminium prints. The big USP offered by Snapfish is 3D and Animated printing. The former uses lenticular printing technology to create a hologram effect, adding depth to your images, while the latter enables you to see two different images simply by rotating the card they are printed on. You’ll need to register an account before you can upload any images – it’s free to do so though, and Snapfish is currently offering 20 free 6x4in prints for registering. The layout of the site isn’t quite as clean as some of the others listed here and there are no product previews or sizing guides either, which makes Snapfish slightly less user-friendly than the other sites. That said, Snapfish’s pricing structure is competitive. As well as quirky photo printing ideas, Bags of Love also offers you bags of control over the size and appearance of canvas prints. There are 12 individual width and height options that can be mixed and matched to produce anything from ultra-wide 60x12in panoramas to 30x80in full-length portraits. You can also opt to have the site’s in-house design team stylise your image with anything from a Warhol Pop Art effect to a Banksy effect. Elsewhere on the site you’ll find jewellery boxes, duvets, iPhone cases, cooking aprons and more, all waiting to be personalised with your photos – if you’re after something a bit different then Bags of Love is one of the best sites. There’s no need to create an account in order to create your items, though you will need to register should you want to save any work-in-progress. The site is well laid out and the creation/editing process is similarly intuitive, with real-time previews of how your photo products will look and an on-screen warning should the resolution of your uploaded images be insufficient. Whereas some sites specialise in wall decor and others in quirky gifts, Zazzle’s biggest strength is personalised clothing. That’s not to say that Zazzle doesn’t offer a good range of classy canvas prints or personalised coffee mugs; there’s even an option to design skateboards! 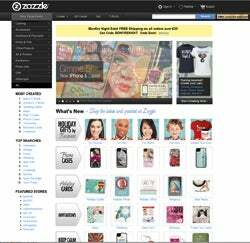 In terms of wall decor Zazzle’s wrapped canvas service is particularly strong, with three frame depths (0.75in, 1.5in and 2.5in) to choose from and all manner of sizes – including your own custom dimensions – catered for. But for personalising clothing, no one beats Zazzle for the sheer range of styles available: from fitted T-shirts to baggy hoodies and from trucker caps to ties, there’s something for every size and shape. The service does come at a something of a premium price though. The Bonusprint site is neatly laid out and easy to navigate, and the company’s range of products is both extensive and competitively priced too. Within the wall decor section, you’ll find a wide range of canvas, acrylic, aluminium, poster and framed print options, while in the gift section you’ll find the usual array of calendars, mugs, mouse mats, fridge magnets and T-shirts – in other words, something for all budgets. The site is fairly easy to navigate and use, although you will need to download a Java applet in order to use the image upload and product creation pages. Once installed the software works well and is quite speedy though, with the site automatically refreshing your edits in real-time and showing you what your finished item will look like, while also giving a brief description of the image quality you can expect. If you’ve taken a number of images of a friend’s wedding or a shared holiday, say – and would like to make something a bit special, you could consider making a photo book. Blurb (www.blurb.co.uk) is perhaps the best-known photo book specialist and offers a good range of options. Blurb’s cheapest product is a 7x7in book, which at 20 pages with a soft cover and standard paper quality will set you back £7.95. At the other extreme, a 20-page, 12x12in book with an image wrap hardcover and ProLine Pearl Photo paper will cost you £55.42. Other sites that come with good reputations for delivering quality end products include Cewe (www.cewe-photobook.co.uk) which supplies photo book services to Jessops among others, and Bonusprint’s parent company (and Gadget Show favourite) Albelli (www.albelli.co.uk).